Couscous is a staple ingredient in North African and Middle Eastern cuisine and is very similar to small pasta such as orzo. Pasta, however, is made from ground wheat while couscous consists of little steamed balls, made from crushed durum wheat semolina. That distinction aside, though, in can be used in very similar fashions as a starchy side dish or the base of a salad. When properly cooked, it should have a very light and fluffy texture. You can usually find couscous in either the pasta aisle of your supermarket or sometimes in the section with grains. Traditional couscous is quite small, but you will also find larger balls of couscous called either Israeli or pearled couscous. Technically the two are not exactly the same, but many manufacturers don't make the distinction and you'll see both types of labels. This recipe uses the larger, pearled-style, but feel free to use the smaller grains if you prefer. 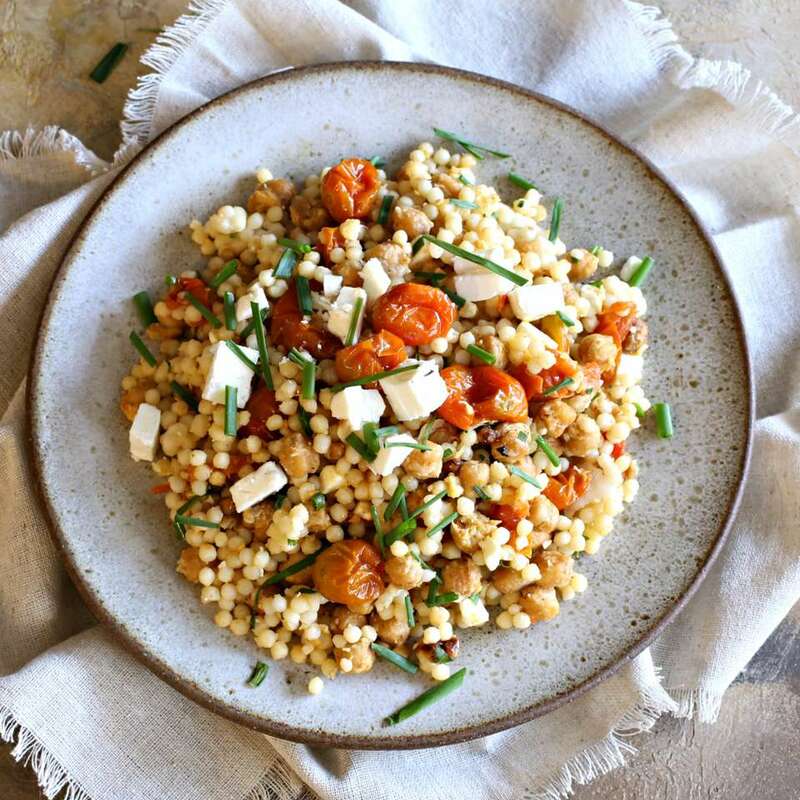 Like pasta, couscous has a mild flavor and benefits from the addition of flavorful ingredients like vegetables and spices. Pre-roasting chickpeas gives them a lovely crunch and great texture against the soft, fluffy couscous. Roasting the cherry tomatoes greatly increases their sweetness and caramelizes their juices. This is also a great way to coax the most amount of flavor from out of season tomatoes. In this recipe, traditional falafel spices, such as cumin and coriander, are sprinkled over the chickpeas and tomatoes prior to roasting. The roasting also makes the spices more aromatic. Crumbled fresh feta adds both flavor and salt to the finished dish. Serve this as a side dish with grilled chicken or fish. Then pack up any leftovers for lunch the next day. The flavors will meld together even more after a night in the refrigerator. Combine the ground cumin, ground coriander, garlic powder, and black pepper in a small bowl. Toss the cherry tomatoes with 1 tablespoon of the olive oil and season with half the spice mixture. Toss the chickpeas with the other tablespoon of olive oil and season with the other half of the spice mixture. Place the chickpeas and tomatoes on a sheet pan lined with parchment paper and roast in the oven for about 30 minutes. Bring the water to a boil in a large pot and add the couscous. Lower the heat and simmer for 10 minutes. Remove from the heat, cover and allow to sit for another 5 to 7 minutes. Fluff with a fork and season lightly with salt. Remember that the feta cheese will add a lot of salt to the final dish. Add the roasted chickpeas and tomatoes to the cooked couscous, stir in the cilantro or parsley and sprinkle with the feta cheese. Serve warm or at room temperature.